Today we’re talking about an essential oil that you’ve probably heard of or have seen in recipes for homemade cleaners: tea tree oil. Tea tree has such a diversity of usefulness that’s both practical and convenient that you’ll never want to live without it again! And the good news is that it is very inexpensive in comparison to other essential oils. Have you ever used essential oils before? Tea tree oil, also known as Melaleuca alternifoliais, is an essential oil that has been around for quite a while. It hasn’t been until the past decade has its healing benefits been catching on like wildfire. The oil is extracted from a plant native to Australia and cannot be found naturally occurring elsewhere. 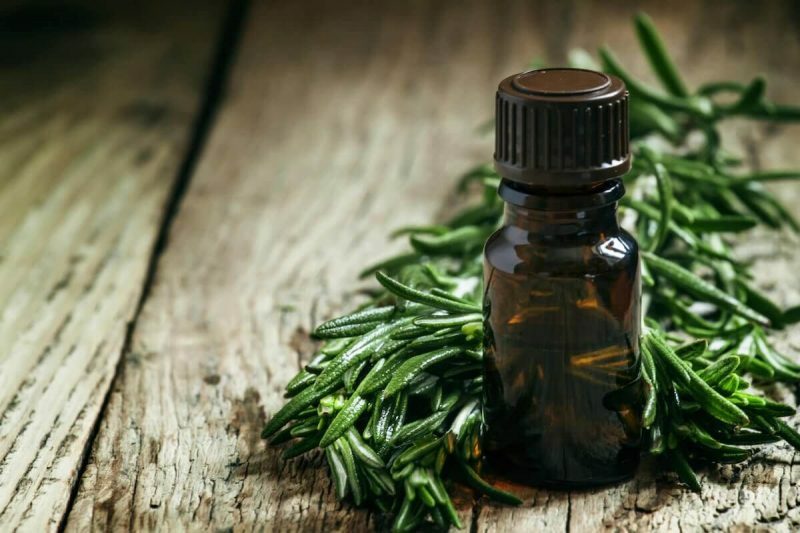 Tea tree oil should NEVER be ingested and is only to be used as a topical remedy. What are the healing benefits of Tea Tree Oil? Tea tree oil is known for its topical antiseptic and anti-fungal treatment or infection-reducing benefits. It also has antibiotic properties and helps aid against aliments such as skin infections, rashes, burns, dandruff and much more. One note: tea tree oil should not be used on babies younger than 6 months. In addition to making things smell lovely (and the benefits that come from that), many essential oils also have healing properties. 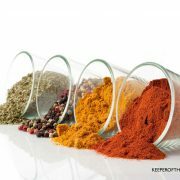 In fact, you can use them to boost the immune system. 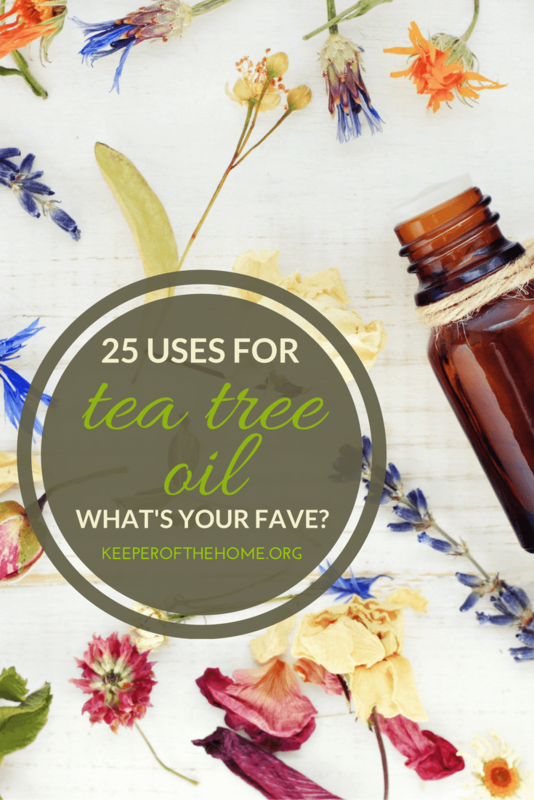 Tea tree oil is something you will want to keep on hand! It’s so versatile and you can use it in so many ways! If you’re just getting started, consider tea tree oil something to put on your list of must-have essential oils. Here are 25 ways you can put it to work for you. 1. Helps heal and soothe sunburns. 2. Heals skin infections naturally. 3. Relieves itchiness from rashes and helps reduce rashes. 4. Can be used as an all-purpose cleaner: Fill a glass spray bottle (which you can BUY HERE) with 1-2 tsp. of tea tree oil and the rest of the bottle with water. 6. Helps to prevent lice naturally: Add a few drops to your shampoo. 7. Add a few drops in your pets’ crates or beds to keep the fleas away. 8. Removes ticks: Add to skin, and the little stinker will usually unlatch. 9. Cures toenail fungus and Athlete’s foot. 10. Helps remove skin tags. 12. Can be used in a homemade toothpaste recipe. 13. Has been found as an effective treatment for warts. 16. Treats psoriasis and other skin conditions. 17. Relieves asthma or other breathing conditions when a few drops are added to a humidifier. 18. Works as an antiseptic on small cuts. 19. Keeps your bathroom fresh. 20. Relieves earaches: Mix 1 drop of tea tree oil with 1 tsp. olive oil, drop mixture into the ear and then remove by tilting head. 21. Freshen laundry: Add a few drops in your washing machine to scent your clothes. Also, if you forgot to put the clothes in the dryer, run again with tea tree oil to remove mildew. You can also scent wool dryer balls with tea tree oil. 23. 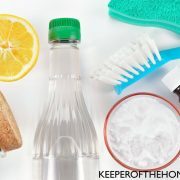 Can be used in several homemade kitchen cleaners. 24. Kills mold: Mix apple cider vinegar and tea tree oil and spray on mold; place outside to sun-dry. 25. 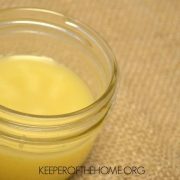 Can be used in a homemade natural deodorant. There you go! 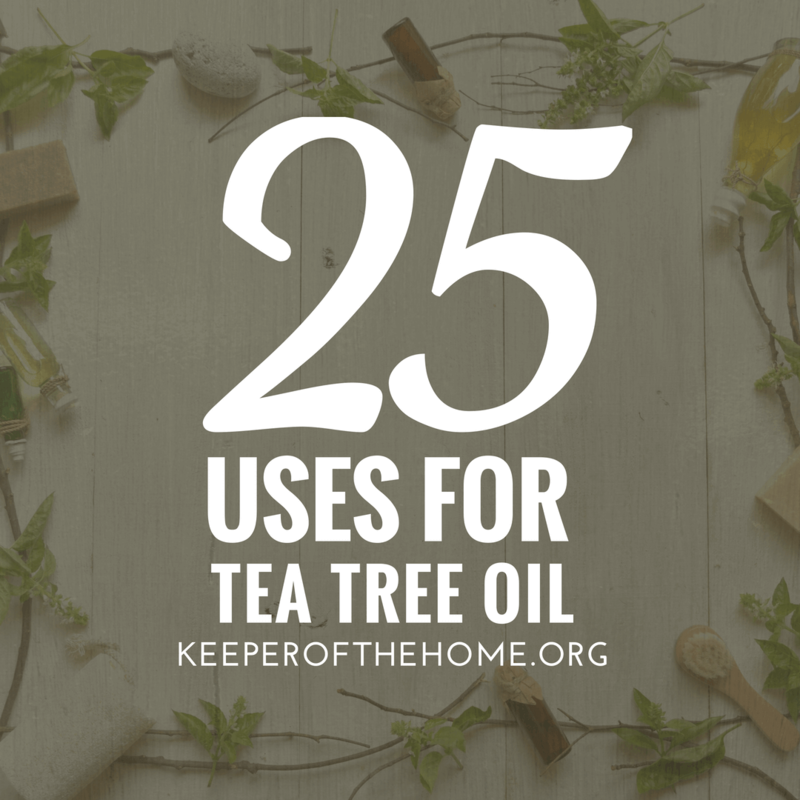 25 different ways to use tea tree oil, the most versatile substance that can go from soothing a burn to removing ticks to freshening your house! Not sure where to buy tea tree oil? Well, that’s easy! CONTACT ME. I have spent YEARS researching this, and the company I use not only has the highest quality therapeutic oils, but they also have a terrific story about supporting the communities and environment. 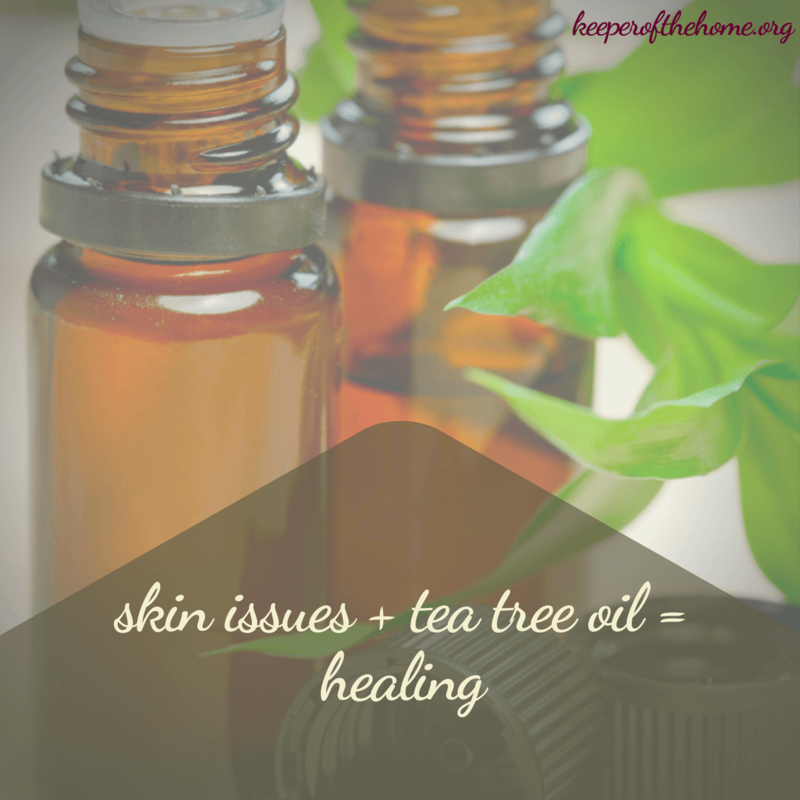 How do YOU use tea tree oil? Disclaimer: Although all of the Keeper of the Home writers are passionate about natural health, none of us are medical professionals. This post is for information and educational purposes only. This post includes both affiliate and referral links. when I go out to work in the yard where ticks abound! I think it keeps them from crawling up my pant legs and landing on my skin. Has anyone else out there tried this? Does it work? Yes, this works amazingly. Tea Tree Oil Rocks! 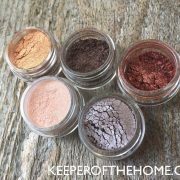 I’ve heard this product will eliminate dust mites om skin and eyelashes. Is this true? I have dust mites colonys on my skin they are called chiggers and they cause staph infections!!!!!!!!!! I found that if I shower with tea tree shower gel it keeps my skin healthy you could also add the oil yourself about 20 drops or so to 40 oz of your favorite gel!!!!!!!!!!!!!!!!!!!!! My friend says they use pine tar soap for this!!!!!!!!!!!!!! !Take at least 2 showers a week!!!!!!!!!!!!!!!!!!!!! You can use manuka honey on herpes to make it feel better and shorten the length of the outbreak !!!!!!!!!!!! The bees get the pollen from the tea tree that’s why it has its healing properties!!!!!!!!!!!!!!!!! I put tea tree oil on my socks with a Q tip when I go out to work in the yard where ticks abound! I think it keeps them from crawling up my pant legs and landing on my skin. Has anyone out there tried this? Does it work? Thank you for sharing. Yes, we have tried this, especially when we do yard work, rake leaves, during our camping trips and more. It works every time. We also put the tea tree roller blend on the back of our necks (to keep them out of our hair and or near our upper body). Wow! I never thought of using tea tree oil before. I will be adding it to my essential oil wish list. Thank you for the information. Tea tree oil works well on acnes. But how to realize if the tea tree isn’t high quality? That is an incredibly important question! I had the same concerns for my family and when I am recommending oils in my psychology practice. 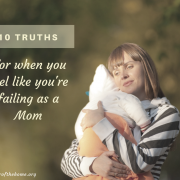 The best way to find out is to be able to access the testing profile for the oils, but that is only available through doTERRA as far as I am aware. Some companies will send you a print out of their testing based on batch, but you can’t always tell which batch your bottle is from. I recommend reading labels. Unfortunately the labels, “pure, organic, 100% oil” are not helpful and frequently not accurate. But I have noticed some brands will say “made from dried herbs.” That is not going to give you the quality of the fresh product. If they have a label that includes the Supplemental Facts that you see on your food, you now have more a guarantee of higher quality. I am always open for free consults if you have questions and would like more support! I am dying to try tea tree oil on areas where my pets sleep, but wont they turn tail and run from the smell? I have a chawhippet dog that is two years old and she is for-ever itching but I very rarely find fleas on her, and she is white. But I want to help keep them out of our bed but leave her in the bed! I also have 11 cats, 6 are inside so when we come in the house we also bring fleas. What do I need to do and how do I do it? Hi Lisa, I have a small dog and I mix coconut oil and tea tree oil and first put it on the palms of my hands, gently rub it and then I massage it into his skin and coat. My suggestion is to start small (meaning use very few drops with your coconut oil) to make sure your dog can tolerate it and does not sneeze like crazy. I love it! Will it work as a mosquito repellent? Enjoyed your article on tea tree oil and am courious about which brand is the best to use. Also is there a difference in oil & essential oil? I’ve been told that it works ridding bed bugs. Is that true? And what other ingredients do I use with it? It’s toxic to cats, and in high concentrations also to dogs. I think they lack an enzyme to break down some of the terpine-ols in the tea tree, which then accumulate in the body after inhaling. NEVER use Tea Tree Oil on or near your pets. It is highly toxic to them. Tea tree helped me a lot as a teenager with me acne. But I know some people it didn’t help them. 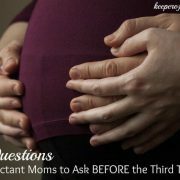 Can T40-C3 be used in babies gums when they are teething? My daughter-in-law travels extensively for her job, therefore spends a lot of time in motels. The first thing she does is put her suitcase in the bathtub, then goes about inspecting the room for bed bugs. A cotton ball soaked in tea tree oil and then wiped along the seams (the piping) of the bed mattress will quickly reveal if there are bed bugs. Also, wipe around light switch plates, dresser drawers and mirror, closets, bed frames – all the likely crevices bugs hide out during the day. They will quickly expose themselves if there is an infestation. Change rooms, and never put suitcases on the ground, only on the wardrobe stand! No it does not work that way ..You should apply it and keep that part undisturbed for 30 mins..